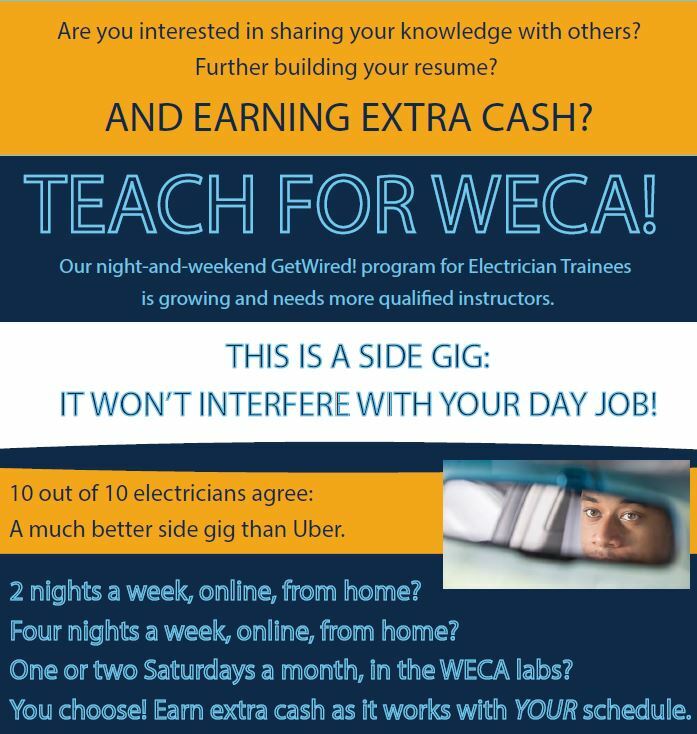 WECA is currently hiring part-time instructors for night and weekend classes! Are you an experienced and knowledgeable electrical professional, with at least one of the following qualifications? Certified Residential or General Electrician with at least 5 years in the trade? Current C10 Contractors license with at least 5 years in the trade? Electrical engineering degree with some electrical trade experience? Vocational teaching degree with previous experience teaching electrical code and theory (will require further evaluation on WECA's part of your knowledge and qualifications)? Retired Electrician with 10 years of experience (will require further evaluation on WECA's part of your knowledge and qualifications)? Maintenance electrician with 10 years of experience (will require further evaluation on WECA's part of your knowledge and qualifications)? Electrician working for a non-C10 contractor with 7 years of experience (will require further evaluation on WECA's part of your knowledge and qualifications)? - Are you an excellent communicator? - Do you have a passion for teaching, explaining, and sharing your knowledge with others? - Do you know how to use a computer? - Would you like the opportunity to teach from your own home computer*, if you have the skills, equipment and an internet connection that meets WECA's requirements? - Would you like to be paid a starting rate of $35 per hour, with regular evaluation for performance-based raises? If you answered "yes" to the questions above, please email your resume and a letter of interest to hr@goweca.com.